The Health Minister’s vowing to continue his war on smoking – and says cigarettes are the only freely available product he knows of that can kill the user. THE GOVERNMENT IS considering a plans which will significantly reduce the number of smokers within the next 12 years. The plan, based on a document called ‘Tobacco-Free Ireland’ aims to reduce the proportion of the population who smoke to just 5 per cent. Health Minister James Reilly says he’s hoping to make the country entirely smoke free, and is working on a number of measures to achieve that aim. It is the only product I know of that is legally and freely available that will kill you, according to the manufacturers’ instructions. The Government has already agreed plans to remove branding from cigarette packs – with legislation expected next year, and Reilly says that’s one way the coalition is working to “denormalise” the habit. 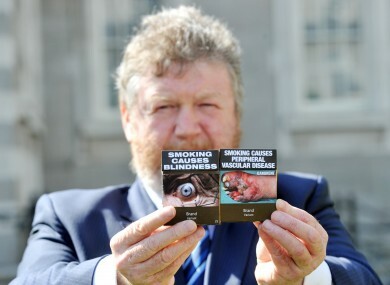 Speaking at the launch of the initiative on plain packaging back in May, Reilly revealed that he had lost his brother and his father to smoking-related diseases. Menthol cigarettes may be also be banned throughout the European Union from 2017, after EU health ministers agreed to a new directive on tabacco sales at a meeting last month – chaired by Reilly as part of Ireland’s EU presidency. James Reilly is on a personal crusade that could do enormous harm to Ireland’s status as a free, consumer-led, society. He should remember that tobacco is a legal product enjoyed by many adults who have no intention of quitting. If anything, they are reaching for their fags in defiance. Research has shown that over 5,200 people die every year from tobacco related diseases and that one in every two smokers will die from their addiction. Email “Reilly working towards 'smoke-free' Ireland by 2025”. Feedback on “Reilly working towards 'smoke-free' Ireland by 2025”.